Impact Guidance System - Asics design philosophy in which the individual components of the shoe work together resulting in a more comfortable step and an improved gait. Rearfoot and Forefoot GEL Cushioning Systems - Silicone-based material placed in critical areas of the sole which dampens shock when the foot hits the ground allowing for a smooth movement through the step and reducing the risk of injury. Fluid Ride technology - a 2-layered sole which provides improved cushioning and ultimate bounce-back while being lightweight. Trusstic System - reduces the weight of the sole unit while retaining the structural integrity of the shoe. Solyte Midsole - exceptionally lightweight cushioning material located in the midsole providing excellent bounce-back and durability. SpEVA Midsole material - Improves bounce back characteristics and decreases midsole breakdown. Clutch counter - Exoskelatal heel counter provides improved support and creates improved heel fitting environment. ComforDry Sockliner- provides cushioning performance and anti-microbial properties for a cooler, drier, healthier environment. You need to spend another £50.00 to get FREE delivery on this order. The GEL-NIMBUS™ 21 shoe was redesigned to give you more room in the forefoot. Plus, its premium mesh upper adapts to your movements for a more comfortable ride. Get more bounce in your stride. FLYTEFOAM™ Propel technology converts impact into bounce-back propulsion, making it easier than ever to run, and run, and run. Plush cushioning will keep you going. 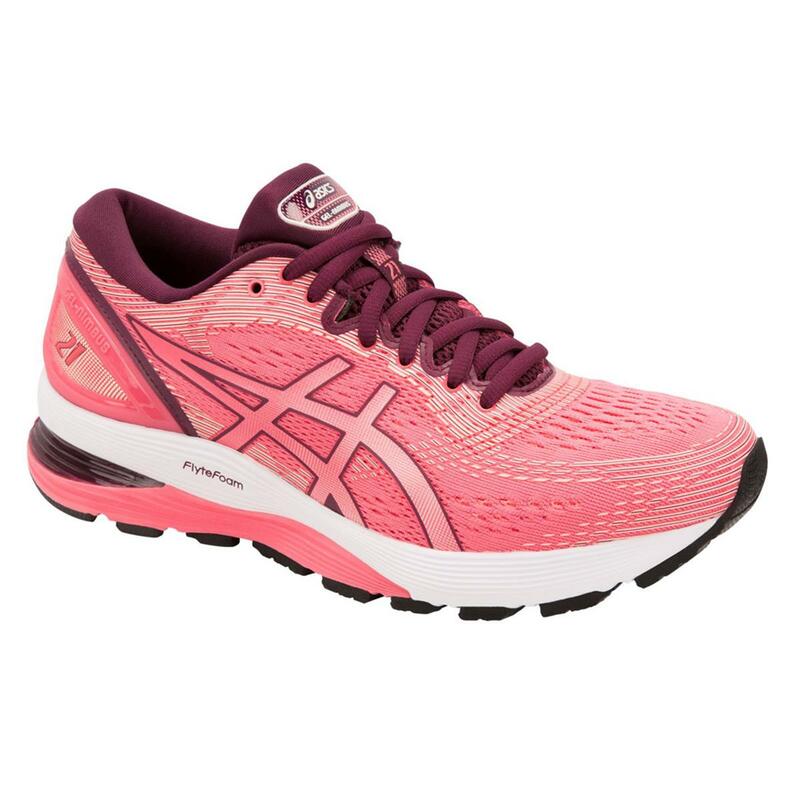 Asics' iconic GEL™ technology provides superior shock absorption in the high-impact zones of your heel and forefoot.